Wendell Hampton Ford (September 8, 1924 – January 22, 2015) was an American politician. He served for twenty-four years in the U.S. Senate and was the 53rd Governor of Kentucky. 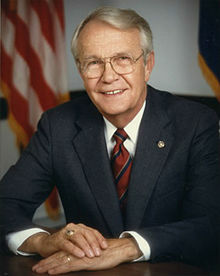 He was the first person to be successively elected lieutenant governor, governor, and U.S. senator in Kentucky history. Ford died in Owensboro, Kentucky from lung cancer, aged 90. ↑ "Wendell H. Ford, Kentucky governor and senator, dies at 90". New York Times.com. Retrieved January 22, 2015. This page was last changed on 31 August 2017, at 14:51.